At least that’s what he claims. Truly, he was an average thug who stole experimental technology and accidentally teleported himself across dimensions to Earth. With no way to return, he’s decided to make a great name for himself here as a super villain rather than the little contract thief he was back home. Riftwalker is a fast mover, naturally capable of running and jumping much higher than a human. He gets his power from the warpshards, an experimental device that through an accidental teleport was fused into his spine. He can’t use the stone’s power on his own, but he can power compatible technologies with it. While wearing his power armor, he doesn’t have true super strength, but he is strong enough to kick a small car or lift a small iron girder. His main weapons draw power from the stone. He has several short-ranged weapon systems such as his powerful Void Ripper Talons and a Pulse Laser that can fire rapid shots. He also has a powerful tail which he can use to sweep the ground to trip foes. He also can bite through almost any material. In a pinch, he will try to flee by opening a safety portal and retreating to safety, however, if he’s brave enough, he may try to draw enormous amounts of warp energy from the crystals to open up a rift to banish foes to a random dimension in the same way he came to Earth. However, since he can’t control the energy, the portal is unstable and collapses quickly. Arrogant and brash, Riftwalker uses his incredible technology and combat prowess to grant him a larger ego than he should have. He acts overtly cruel exudes haughty confidence as long as he is winning, but will falter when overwhelmed. He adheres to the notion that “tucking your tail and running is the better part of valor” and will teleport to escape dangerous situations and only shows his yellow belly when he can’t escape, which is rare. Though he has knowledge of creating and maintaining his own advanced technology, he can be quite dim when spoken to and is very quick to frustration and anger. Kredak B’Kaz is from a version of Earth where dinosaurs were never wiped out by a global catastrophe and instead eventually developed intelligence. 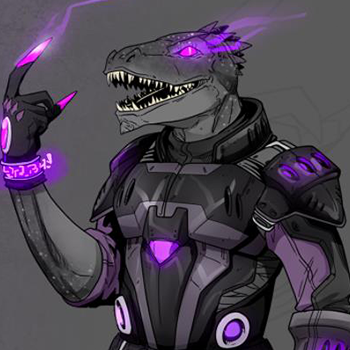 His world is home to various species of evolved dinosaurs, both quadruped and bipedal, with highly advanced technology on the verge of becoming a space faring race using what would’ve would been their greatest achievement: the Shard Drive, an engine technology able to bend space to travel great distances. During its development, Kredak, a contract thief, was hired to steal the shards and drive technology. Kredak himself was nothing special; just a run-of-the-mill thug with a penchant for sneaking into place and stealing their technology for the highest bidder. During the heist, he came across an experimental power armor suit. After carefully swiping the shards and data, he doubled back and tried to steal the power suit. However, the suit lacked a power source. Thinking the shards were mere batteries, he decided to toss the shards into the energy core and escape. When he tried to power the suit’s laser system to blast a hole through a wall, he wound up creating an incredibly unstable portal that not only teleported him away from the scene, but also out of his home dimension. During the teleport, the shards itself destabilized and fused through the power armor into Kredak, grafting itself onto his spine. He spent for what felt like hours spiraling uncontrollably through the space between dimensions until he wound up on the outskirts of San Ceilo. Fortunately for him, he woke up on a foreign world with a breathable atmosphere; a planet he would eventually discover was a parallel version of his own. Now, stuck on an alien world in a different dimension with a failing power suit and weird rocks in his back, Kredak had no choice but to teach himself the ins and outs of stolen technology that he was nowhere near qualified to even begin to fathom. Now, it’s been over a decade since Kredak accidentally teleported to this dimension. Though he doesn’t quite understand exactly how it works, he is still able to maintain his power suit, utilize the power of the crystals in his back to terrorize humanity, and, as an added bonus, he learned how to speak English. He now goes by the name “Riftwalker” after the technology that gave him his powers and lavish, larger-than-life, villainous lifestyle. Quotes "I am Riftwalker, the greatest hunter this or any world will ever know!" "How does it feel to be back on the food chain, human?" "Give me the goods and maybe I won’t throw you into another dimension!"